I know I have not been writing as frequently as I was before. There are two main reasons behind it. First reason is that I have not been in the best of my health in the past some time. Second reason is that I have become quite busy in many activities including consultations and similar stuff which leave me almost no time to write blog posts. So I request everyone to patiently wait for my new blog posts. 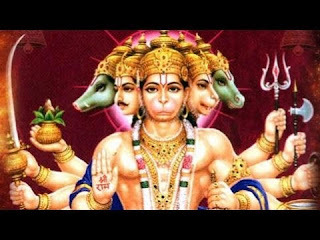 I am going to post a strong mantra in this post which if done regularly and with complete faith and devotion, removes the ill effects of planet Saturn like hurdles, delays, struggles, frequent disappointments and failures etc. I have taken this mantra from an ancient book called "Agastya Samhita" It has already given benefit to many individuals out there. This mantra belongs to Lord Hanuman who is also called 'Aanjaneyaaye'. So he should be remembered with pure heart while reciting this mantra. Along with this mantra some other things may help in countering ill effects of planet Saturn. 1) Wearing a 14 mukhi rudraksha in a black or red thread around neck not only improves planet Saturn but it also protects from the effect of evil energy, evil eye and evil spirits. 2) Reciting Shani beej mantra also gives positive effects. "Om Sham Shanish Charaaye Namaha". 3) Shani yantra can also be worn to please planet shani.